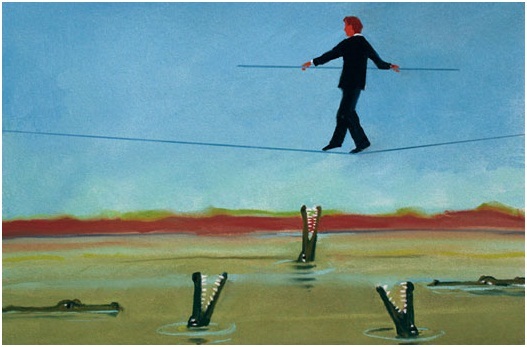 Living in an uncertain world makes proper Risk Management critical for survival. In our age of frequent natural and man-made disasters, volatile markets and economic meltdowns, recognizing and targeting of possible risks is of Manager’s highest priorities. However, Risk management is quite a complicated affair, especially on organizational level, and it utilizes several important tools that are crucial to master if you want to do it right. Today I would like to address Risk Awareness, without which Risk management becomes a nightmare for any Project Manager. Risk Awareness is a standalone topic inside Risk Management. It deals with a very simple, but nevertheless critical question: who watches the environment for possible risks? Even with the most advanced systems and processes in place to track risks, not having people on board who’re identifying risks properly, the risk management system becomes a burden, a waste of resources, with real risks being managed in personal excel files, detached from the situation at hand. With the help of Risk Awareness, the Project Manager relies heavily on all stakeholders to be his eyes and ears in the field; while he’s managing the risks – everybody else is charged with the task of their detection and communication. There are also organizational barriers such as hierarchy, political games and broken communication. We cannot mend communication channels, change hierarchy or established culture in one day, but what can be done is engraving a different approach to Risk Management in your team, on your project. Making everyone on the project team a risk detection agent on a constant look up for any possible risks will directly impact how effective is your Risk management. This is not unlike we teach our children to be on guard for possible hazards, and in the case of one to come home and always tell the parents, otherwise we won’t be able to react accordingly and in a timely manner. Raising the Risk Awareness of the Team is one of the most critical engagement rules every manager should instill in his or her staff. Socialize/broadcast to everyone when issue was averted due to a timely raised risk. This entry was posted in Competence Training, Life without biases, Project Management, Risk Management, Tools and Techniques and tagged Competence Training, Life without biases, Management, Management styles, Organizational Change, Risk management by AnyaWorkSmart. Bookmark the permalink. I think being curious is very important when it comes to risk identification and risk management.